Very basic information so don’t let the title lead you to think otherwise. Written with a simple language making it easy to read especially for the novice or not-so technical minded. Every basic action is explained and walked through so there’s no guesswork involved. Covers from how to buy a book to highlighting passages and organizing the books on shelves. 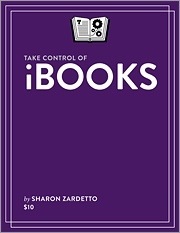 Great for someone just getting into using an iPad and wanting to read on it or who has a newer Mac and wants to learn how to read books with iBooks on that. A free copy was provided by the publisher in exchange for an honest unbiased review.